Phenoxy PK™ HP-200 by Gabriel Chemical is a tough, ductile, amorphous phenoxy resin (polyhydroxyl ether). It is a micronized powder–grade. It exhibits excellent thermal stability, good adhesion & cohesion strength and excellent vapor barrier properties. It can be crosslinked by reacting its hydroxyl functional groups with isocyanates, melamine resins and phenolic resins. It provides ease of incorporation into liquid resins due to its high surface area. 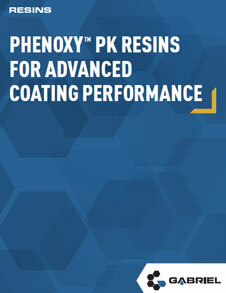 Phenoxy PK™ HP-200 is suitable for single-pack epoxy and dicyandiamide (DICY) coatings. The recommended level incorporated into epoxy resin is 5-25%. It complies with TSCA, DSL, PICCS, AICS, ENCS/MITI, IECSC and EINECS (EU) regulations.